SOCHI, Russia — Forget the slapdash hotel rooms of Sochi. See you on the lido deck. Some Americans are enjoying the Winter Olympics from the comfort of three enormous cruise ships bobbing on the Black Sea — little noticed by most fans but docked within sight of the arenas hosting big events like figure skating. Together the three vessels can hold about 5,000 people. And the guests of these floating hotels include the parents of most of the silver medal-winning women’s hockey team. They aren’t doing it for the shuffleboard. Some of the Americans say they opted for the ships because of concerns about security in Sochi, or because they read reports before the games that hotel rooms weren’t going to be finished in time. “You feel safer because you’re on a boat." Sochi organizers would argue that the traditional hotel rooms are plenty secure — they’re within Russia’s famed, and so far impenetrable, “ring of steel” security zone — but the ships are impressively safeguarded. To get on the Grand Holiday, for example, you have to flash Olympic fan credentials at three security checks, including one metal detector and two stations where guards check passports. Once you’re on board, though — well, let’s just say there are no worries about muddy hotel grounds, brown tap water or meandering stray dogs. The Grand Holiday has a spa, a disco and three Jacuzzis. It also has three restaurants. The lunch menu at one of them, on a recent day when NBC News boarded as a guest of two people staying on the ship, included beef burgundy with chateau potatoes, chicken cordon bleu, calamari and ratatouille. Sadly, the casino is closed, at least while the ship is docked in Sochi. Before the Olympics, the Kays were alarmed by incessant news accounts about a terrorist threat to the games — so much that they considered canceling their trip. They had attended the previous seven Olympics and eight of the past nine. But they were reassured by reports that U.S. warships would be positioned in the Black Sea, perhaps able to help evacuate Americans if something went wrong. When Mary Kay found an online listing for rooms on the ship, they decided to come to Sochi. The Kays, who gushed about their experience in Sochi, are paying a little more than $5,000 total for 17 days on the ship. Their room is small and spare — some closets, a double bed and not much else — but has a view of the Caucasus Mountains. 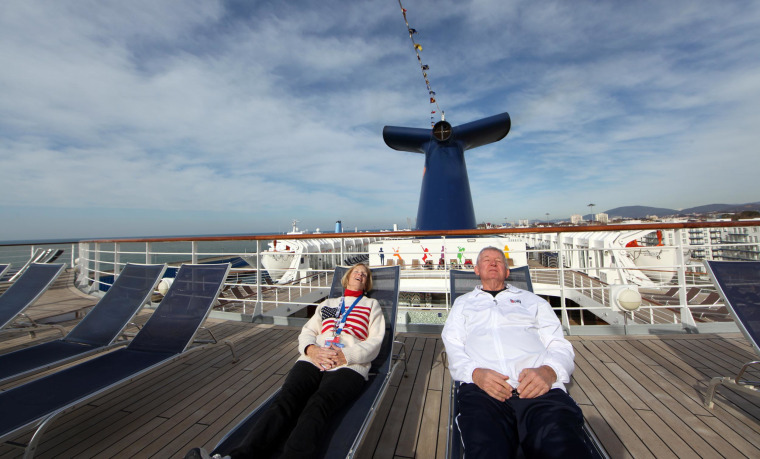 They keep a packed Olympic schedule, usually two events a day, but when temperatures soared into the 60s earlier in the games, a cruise ship seemed the right place to be. They napped on one of the decks. Next door to them are the Thomson Spirit and the Louis Olympia, with comparable amenities. Among the Olympic distractions on the Louis Olympia, for example, are five bars, a hair salon and a massage room. The Louis Olympia and Grand Holiday can also boast a gaggle of hockey families. All but a handful of the families of the women’s hockey team, which took silver in Sochi, are staying on the two ships, said Susan McLoughlin, the mother of Brianne McLaughlin, a goalie. “We were told many, many months ahead of time that nothing was really ready." The only drawback, she said, is that the families are so exhausted by the day’s activities in Sochi that they don’t have the energy to do much on the boat besides sit and get to know each other. It is not clear how full the ships are — calls to their parent companies went unreturned — but each day, guests stream onto the gritty patch of land at Adler Seaport and hail cabs to events, or make the half-hour’s walk toward Olympic Park. The 22,000 hotel rooms that Russia had to build on dry land to stage the Sochi Games have not enjoyed such rave reviews. An International Olympic Committee official said earlier in the games that it took a “red alert” to get everything ready, and arriving visitors in Sochi found rooms still missing bathroom fixtures, hot water or even lobbies. Doc Noori, a friend of Subong’s who traveled with him from Sacramento to Sochi, said they booked hotel rooms months before the Olympics. But the hotel is 30 miles away from the main events, and expensive. The clincher came when the friends read reviews online three months ago saying that the bathrooms weren’t working. They canceled and booked at the Grand Holiday, paying about $2,000 apiece for nine nights. “The quarters are a little cramped, but they’re clean." His only complaint hardly even registers as one of Sochi’s infamous #SochiProblems.